The All Golds were indebted to their scrum half Callum Merrett and stand off Dieter Thomas as they completed an unbeaten West of England campaign by wresting the title away from Swindon St George in the rain in Bristol. Thomas showed quick thinking as he crossed twice from close range while Merrett’s Man of the Match performance was capped with a fine individual try. There was little to choose between the sides in an attritional game. Perhaps anticipating the conditions, Swindon selected a big side in a bid to overpower the smaller but faster All Golds outfit and their tactics worked in a tight, forward-dominated first half that they just edged on the scoreboard 6-4. The All Golds dominated the third quarter, Thomas and Merrett doing the damage with tries and they stepped up their defensive intensity to withstand a late siege to take the crown. The game started in fine drizzle and it was Swindon who settled first forcing the All Golds into mistakes as they conceded a raft of penalties. However, the All Golds’ defence held firm. St George wasted two great opportunities to score before deservedly taking the lead on 21 minutes. After the All Golds conceded an unnecessary penalty St George went downfield and worked the ball wide to Scott Douglas who went over. Rhys Evans added a good goal. The All Golds took ten minutes to hit back but finally broke through when Sam Hodge bashed his way over from dummy half. Mike Holden was unable to convert but the All Golds were back in the game. Six minutes into the second half, the Swindon goal-line defence was found wanting again as Thomas slipped through a gap for his first try. Holden added the goal but Swindon were soon back on terms. Evans spotted space behind the All Golds line and Douglas did well to gather the ball and touch down. The try was unconverted and the scores locked at 10-10. However, the Wiltshire side lost possession early in their next set, gifting the All Golds field position and Merrett accepted the gift skipping along the defensive line until the gap inevitably appeared and he coasted the ten metres to the posts. Holden made no mistake with the extras and the All Golds were back in front. They were now on top and, despite losing Hodge to the sin bin along with Swindon’s Sam Collins, extended their advantage. Again it was Thomas who took advantage of Swindon’s disorganised defence on their line to steal another four points from dummy half. Holden made no mistake to put two scores between the sides. The game began to get scrappy as Swindon’s desperation to score added to the worsening conditions and they seemed unable to get beyond the first or second tackle of their sets. However, the All Golds gave them a lifeline by conceding a penalty at their own scrum and Josh Verity went over. Evans was unable to convert with just five minutes left for play. 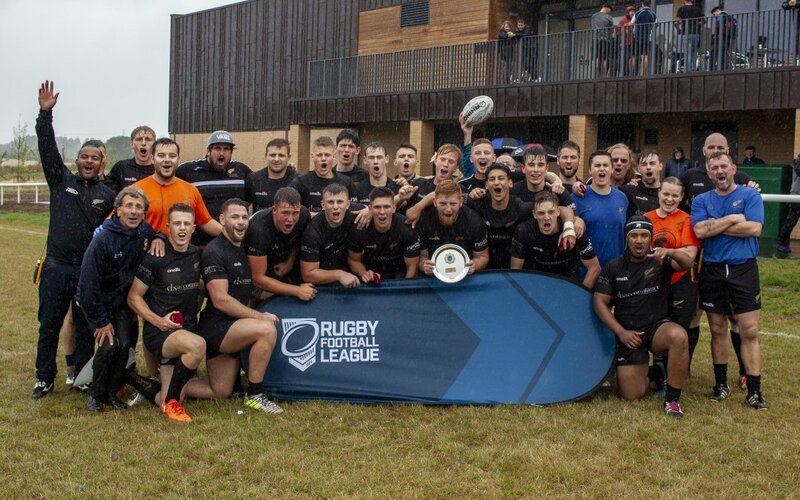 The All Golds forced a mistake from the restart but couldn’t capitalise on the opportunity and were forced to rely on their composure and their defence to take the title in their first season in the West of England league. As the hot summer broke so Swindon threatened to break the All Golds 100% record and retain their crown but the All Golds proved that they can dig deep and battle out the tough games as well as rack up cricket scores. INTERCHANGE: Josh Llewelyn, Joe Uren, Kieran Webb, Hector Silva, Josh Stafford-Smith, Mitch Dent, Alasdair Anderson. SWINDON: Liam Rowe; Simon Addis, Jack Daynes, Florin Palcau, Scott Douglas; Rhys Evans, James Slatter; Paul Bolger, Stewart Hannah, Richard White; Joe Collins, Henry Beer; Todd Johnson; INTERCHANGE: K Sekope Sokowasa, Sam Collins, Greig O’Brien, Connor Tomley, Josh Verity, Chris Kent (Capt. ), Jarrod Dixon. Man of the Match: Callum Merrett – The scrum half was instrumental in turning the tide in the All Golds’ favour in the second half. Game Breaker: Dieter Thomas’s second try, which put the All Golds two converted scores ahead of a tiring Swindon side with less than 20 minutes remaining.